The roadmap to an extraordinary adventure can also be an extraordinary design. A seamless cooperation between two innovative Estonian companies has resulted in a unique pop-up office solution offering a desirable and stress-reducing working environment while boosting motivation and inspiration. The co-creation of prefab house producer ÖÖD and WOODMAN, who specialize in furniture design, has already received worldwide recognition. Their creative visions of a modern pop-up office and meeting rooms will be presented during the prestigious XIII Tallinn Design Festival. 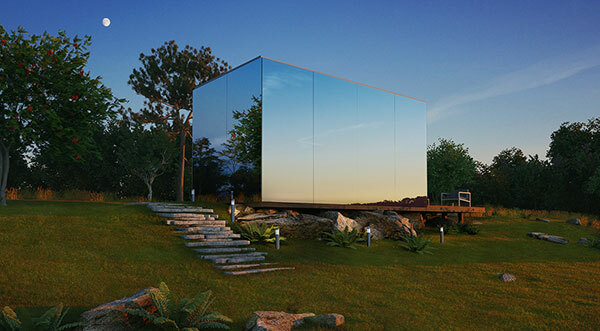 The ÖÖD mirrored house, with its modern, yet tasteful, shape looks entirely at home in beautiful landscapes as well as the urban milieu. The ergonomic, functional and luminous ÖÖD office enables up to six workstations and creative reorganizing results in an innovative and highly functional meeting room. The unique yet user-friendly WOODMAN office space fills the room with colours and the warm touch of real wood. Oak, which has been a much-loved staple of craftsmanship for centuries, is the key element of WOODMAN's furniture designs. Stylish shapes and colours and fine finishing will enliven the interior. An integral part of the modern office space may also be fun lights, practical coat stands, a minimalist light-blue sofa or a book shelf that acts as a separation wall. Elegant on the outside and practical and stylish on the inside, this smart and clearly defined Estonian design offers an unparalleled working environment. Come and get acquainted with the creative force of ÖÖD and WOODMAN. The doors of the mirrored pop-up office are open to all visitors during the Tallinn Design Festival and the following two weeks. Discover the Estonian design adventure at the Museum of Estonian Architecture (Ahtri tn 2, courtyard) from September 10–16!